Random acts of kindness were everywhere on the Samford University campus Jan. 28-31 as the university responded to an unexpected winter storm that dumped several inches of snow on the Birmingham area. Early predictions for a "dusting" of snow proved wrong. Snow began falling about 9 a.m. Tuesday, and by 11 a.m., university officials had closed the campus for the day. Snow and ice, coupled with traffic gridlock across the metropolitan area caused several hundred Samford commuting students and employees to be stranded on campus. Samford's emergency response team worked throughout the day to provide services for the more than 2,000 residential students and those who were stranded. An emergency shelter was set up in the gym in Seibert Hall with mattresses provided by the residence life office and towels for showers provided by athletics. Campus Dining, Inc., the university's food service vendor, worked with university officials to provide meals for stranded employees and students. Campus Dining officials reported serving more than 3,000 meals on Tuesday evening, about three times the normal Tuesday evening crowd. 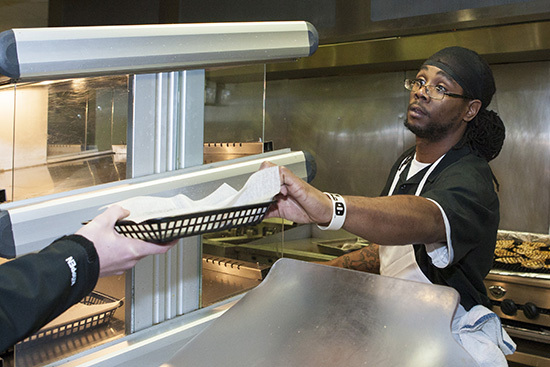 Several Campus Dining staff members stayed on campus for several days to ensure that food service would not be affected. Facilities and public safety crews worked well into the evening on Tuesday and began again about 5:30 a.m. on Wednesday to clear campus roadways, building entryways and sidewalks. As of early Thursday, the Alabama Department of Transportation was advising motorists to stay off roadways to allow crews to treat and clear. "Under the circumstances, I think we can be proud of the way the campus has responded," said Harry B. Brock III, the Samford vice president who convenes the emergency response team. Residence life staff and resident students collected sleeping bags, pillows, linens and extra toiletries and delivered them to stranded employees and students staying in offices and campus buildings. Also from Twitter: RT @mossrenie: Thank you @SamfordU students for walking around campus to offer extra blankets and pillows to stranded employees tonight! On-campus resident students invited stranded students to share their rooms and bathrooms for the night. Some employees even took advantage of their sons and daughters who live on campus to unexpectedly share their rooms for the night. Students provided snacks for motorists stranded along Lakeshore Drive, the state highway that fronts the campus. A Twitter post: RT @bradradice: @PatrickClaybon Samford students giving snacks to folks on the road...pretty cool. A prospective student visiting from Nashville, Tenn., got an unexpected overnight stay in the university's "show room," a prototype in Pittman Hall that normally is only shown on campus tours for prospective students and their families. Movies were shown in the law library and other places on campus to provide entertainment for those who were stranded. Music faculty and students provided an impromptu midnight jam session in Brock Recital Hall. On Thursday afternoon, music faculty hosted an impromptu hymn sing for the campus community in Brock Recital Hall. Several employees and students who became stranded yesterday after leaving campus reported being helped by other Samford employees or students who stopped to assist them. Several stranded students and employees experienced medical emergencies because of low supplies of medication. Fellow employees rose to the challenge, providing medications and even making trips to nearby pharmacies to help pick up emergency prescriptions. The university's health services staff and nursing school faculty also made themselves available to assist with on-campus medical emergencies, as needed. A woman who was stranded on Interstate 65 found Samford on her mobile map and walked the more than two miles to campus, where she was able to stay and eat until the roads cleared. Several others who were stranded in nearby office buildings or along Lakeshore Drive had similar hospitality experiences from Samford. Several University Advancement employees were beneficiaries of a random act of kindness -- in Atlanta, which also was impacted by the same storm that hit Birmingham. They could not reach their hotel destination after an all-day conference. The hotel where they did stop was full, but hotel management said they could stay in the lobby. A guest heard about their situation and offered the five women his suite while he stayed in the lobby. Andy Parrish, general manager of Samford's WVSU-FM, did a live request show Tuesday night to help stranded listeners. At one point he played a Jeffrey Osborne version of "Baby, It's Cold Outside." Samford officials said students and employees are making the best of the situation. "The spirit on campus has been good, and people continue to be cooperative and patient as we work through this emergency," said Randy Pittman, Samford's vice president for advancement. "It is just another example of the strong Samford community." Conditions were improving by Thursday, and many stranded employees and students were beginning to head home. But, classes were cancelled again for Thursday and Friday because of concerns for travel and movement around campus. Officials said that also will gave adequate time to prepare the campus facilities and services to return to normal operations. The university returned to normal operations on Saturday, Feb. 1, and spring semester classes resumed Monday, Feb. 3.